On a visit to New York last summer, we stopped for coffee at a bakery and espresso shop famous for its original Cantucci on the edge of the Village. 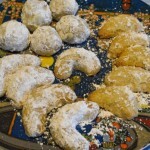 Cantucci are biscotti. 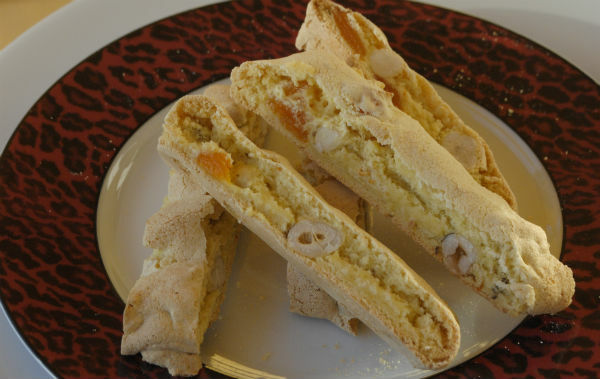 What I noticed about this biscotti-Cantucci is they contained bigger chunks of dried fruits, figs, apricots, and bigger chunks of chocolate, and whole nuts. The texture was crisp and light on the outside and almost chewy in the interior. Rich yellow golden in color, they are definitely more rustic and cut in 1/ 2 to 3/ 4 inch thicker slices. A very wonderful cookie for eating and dunking in coffee. 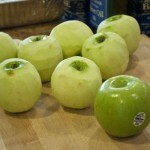 I thought instantly I want to make these, but of course the recipe of the shop is a proprietary secret. My baking experience screamed at me, lots of eggs, separated egg whites, meringue. 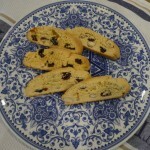 I did some research and reviewed many cantucci recipes. Some indeed called for separating the eggs and making a meringue. Then, I thought about the French Macaron class I had taken at the Gourmandise Cooking School and how the method of folding in the meringue was essential to the texture of the cookie. My favorite of all the batches was apricot with hazelnuts. This recipe also worked well cut in half. However, the cantucci store for a while in an airtight container and if you are dragging out the baking stuff, I always think more is better. You will need four rimmed baking sheets lined with parchment paper. And two extra sheets of parchment paper to change out for the second baking. 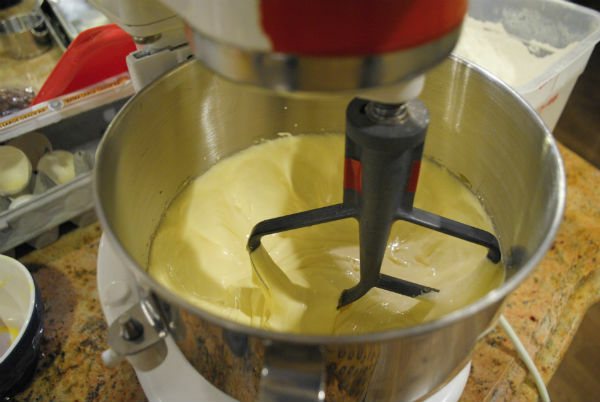 Place egg yolks and two cups sugar in mixing bowl of stand mixer. Beat until very thick and light yellow in color. Add 1/ 2 teaspoon salt to flour, mix and add flour to egg yolks in mixer. Starting on the lowest setting carefully combine flour and egg yolks. 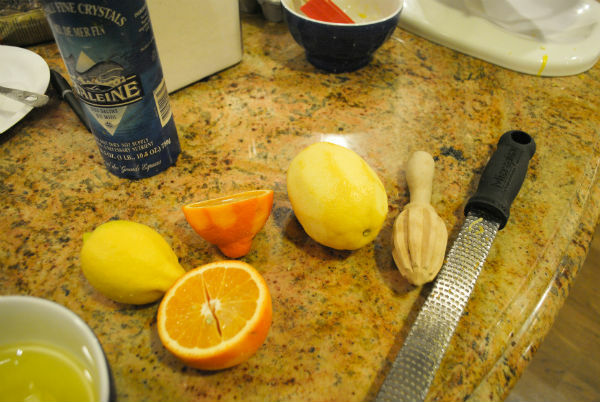 Add zest, vanilla and orange juice. At this point the mixture will be very dry and crumbly. Empty out the contents of mixing bowl into a larger bowl and add in hazelnuts and dried apricots, then set aside. In a clean mixing bowl, place egg whites and pinch of salt. 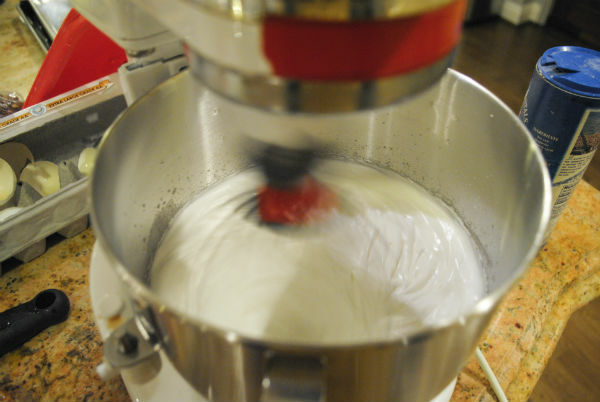 Beat egg whites on medium-high until soft peaks begin to form. Slowly stream in remaining one cup of sugar while beating on high speed. Beat until meringue is very thick, glossy, at least tripled in volume, and starting to pull away from side of mixing bowl. Heat oven to 350° F. Gently place one quarter of meringue on top of egg yolks and flour mix in the larger bowl. Using a very large straight rubber or silicone spatula, fold in meringue to loosen batter. Add remaining egg white meringue and fold in very carefully. To fold in, hold spatula straight up and down, scoop from the side all the way underneath and turn. The idea is to preserve as many air bubbles of the meringue as possible. After about 3 or 4 turns cut down the middle of the batter and repeat. 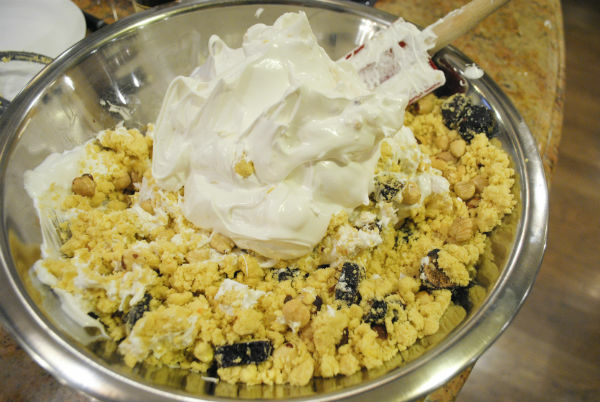 Continue until crumbly flour mixture is incorporated into meringue and then stop. Don’t over mix. 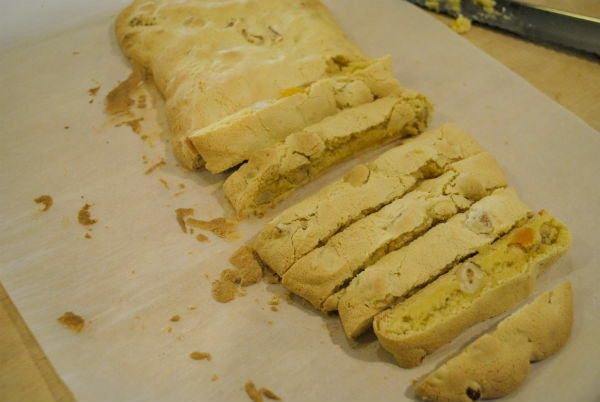 Take one quarter of cantucci batter and gently form a log on top of parchment lined baking sheet. 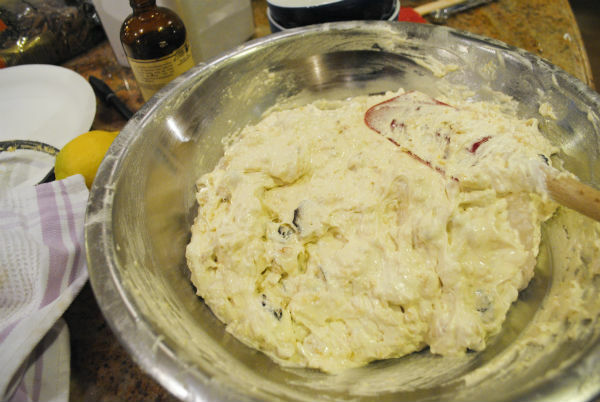 Batter is sticky and loose but will hold the shape of a log. It will not be smooth like other biscotti. This recipe makes four logs about 3 inches wide by 12 inches long. 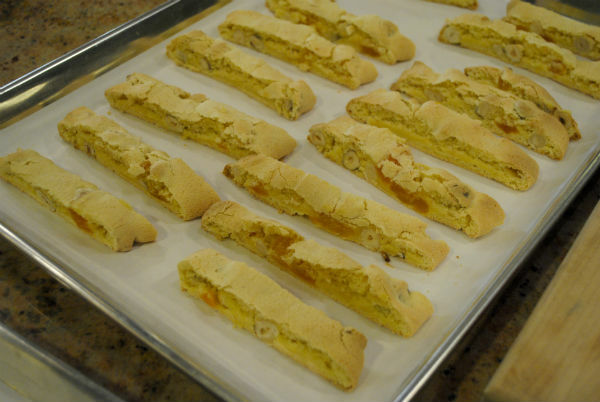 Place Cantucci in oven and bake for about 20 to25 minutes until golden. 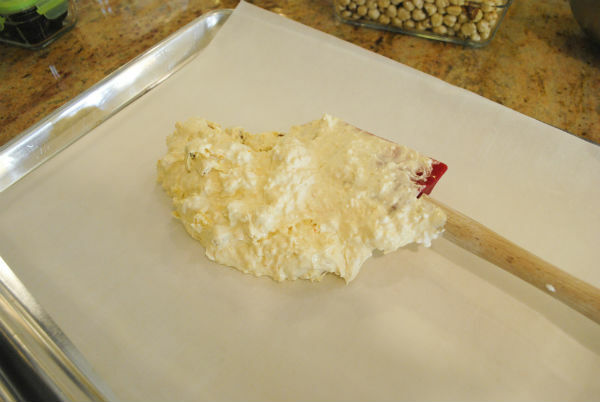 Remove Cantucci logs from oven and immediately turn oven temperature down to 300° F.
Grabbing ends of parchment paper slide hot cantucci onto a large cutting board. With a very sharp knife slice cantucci in to short horizontal slices. 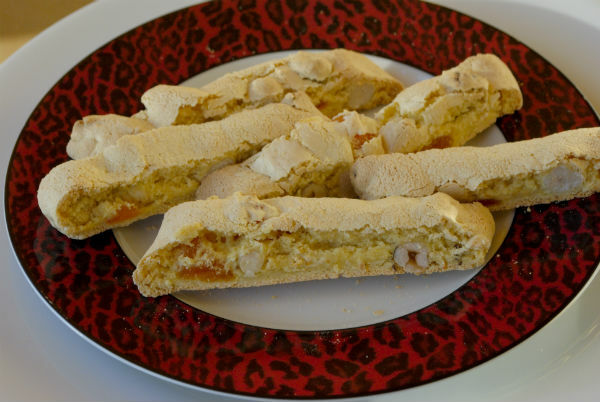 The cantucci may seem almost raw or definitely underbaked inside. Keep slicing. Place a clean sheet of parchment paper on baking sheet and carefully place sliced cantucci on clean parchment paper using a metal spatula. Two logs worth of slices will probably fit on one baking sheet for the second baking. Place sliced cantucci back in reduced temperature oven for about 5 minutes. Turn oven off and leave cantucci in oven for another 5 to 10 minutes. 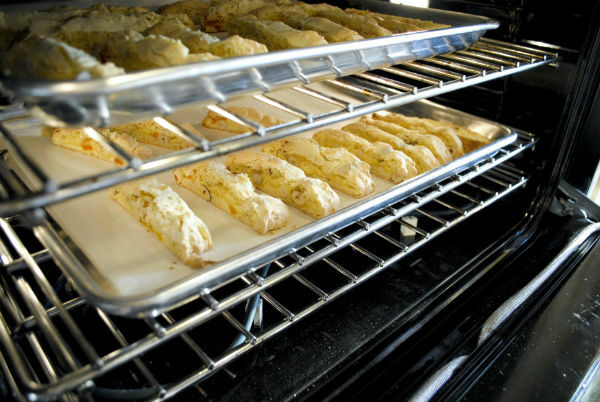 Remove baking sheets from oven and allow to cool completely before storing. This looks divine. I will give it a try. Kudos for coming up with it. I imagine I can substitute Majool dates for example…choc chips? Thank you. This recipe looks yummy!!!! 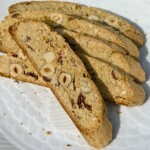 We love your recipe for biscotti with hazelnuts and craisins. I have to give this one a try. Thanks for all your experimenting and pictures. 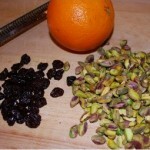 Linda – I just tried your recipe today – figs + hazelnuts, apricots + hazelnuts and chocolate + almonds. 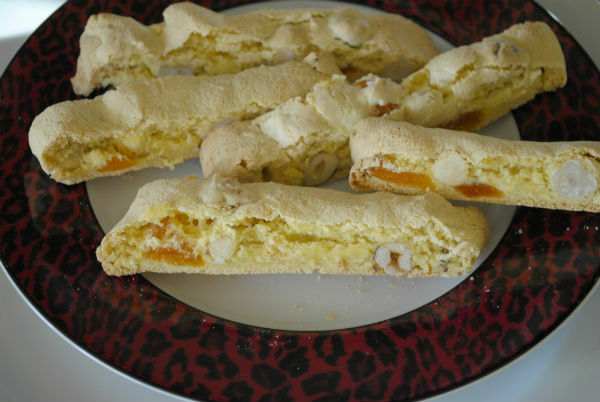 They are all delicious but I think the apricot + hazelnuts are my favourites too. Many thanks as I’m a fan of that cantucci shop in the village too and so glad I can finally make my own!